A special kind of biscuit, light and friable, The Montecatini Cialda is produced following ancient recipes of the local tradition, had great success and awareness between the first and the second World War. Its typical round shape is due to the plates where the paste is cooked upon and becomes a characteristic fillo dough. The standard mixture includes flour, milk, egg yolk, sugar, minced almonds; in addition, each producer employ secret ingredients, jelously protected inside their artisanal laboratories. Cialde are scrummy matched with ice cream, fruits, hot chocolate, milk cream and even coffee or thea. Typical sweets that you can find on the display cases of local villages festivals and celebration days, is told that Brigidini have been invented in 6th century by the nuns of an ancient monastery near Pistoia (named “Brigidine” as devotees of Santa Brigida). More recently, these artisanal products have found space and distribution through the best typical food chains and points of sale. In this case the fillo dough is mainly seasoned with anise, sometimes with other spices in short dose. Presenting an unmistakable smell and flavour, Brigidini are liked by children and adults for their delicacy, friability and genuineness. 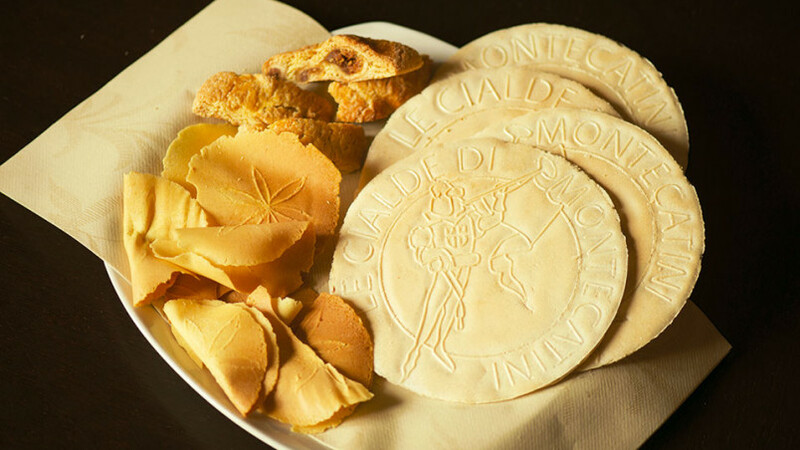 Famous Montecatini Cialde are scrummy, matched with ice cream, fruits, hot chocolate, milk cream and even coffee or the afternoon thea. There is no celebration without a tray of Brigidini on the table!